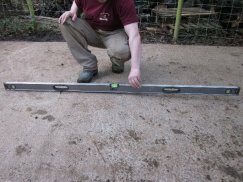 One of the key things we discuss with customers prior to installation one of our Garden Buildings is the importance of a flat, level base for us to install on to. It may seem insignificant, but it is actually a crucial part of installation, with just 5mm being the difference between having a problem-free building or one that is fraught with problems. Even one of our smaller storage sheds is very heavy - with uneven flagstones or soft ground, over time, the building will "settle" into its foundation, leading to premature deterioration of a building that would otherwise have a lifetime of 30+ years. Door and window frames drop out of alignment, causing problems with opening or closing them. Undue stress can be put on other parts of the structure, leading to cracking or breaking. Cracks that appear can allow rainwater to find its way in to the building and damage items stored within the building. A concrete base provides a consistently even and solid surface, which will keep even the largest and heaviest garden building stable and correctly aligned. Do not position a base too close to existing fences or buildings. Although our buildings are generally low maintenance, you will still need to repaint your building occasionally (we suggest renewing Classic Shed paint every 2-3 years, our Sikkens Paint every 4-5 years and our Valtti Paint every 8-10 years), meaning you will need access around the building for routine maintenance and upkeep. With this in mind, we suggest a minimum gap of 30cm on all sides of the building. Clear any debris that may be in the way of placing a concrete base including lumps of concrete if you’ve had an old base removed etc. The ground should be as level as possible before a base is laid. Ensure overhanging trees or bushes are cut away and that you regularly maintain them to prevent damage from branches scratching and damaging the building, creepers forcing their way through joins, or potentially even falling limbs. If you intend to use your chosen garden building for leisure, rather than for more practical reasons, such as storage, consider what view you want when you’re in it and the path the sun takes across your garden to make the best of the available sunlight when you use it. Consider accessibility - if you intend to use your garden building for storage, how far will you need to go if you are carrying heavy objects? Or, if you require water or an electrical hook-up, how far will the shed be away from the source? 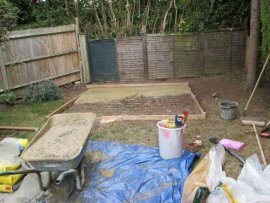 Local ground conditions can greatly affect the finished concrete base, but it is imperative that it provides sufficient support and we strongly recommend getting professional help when laying a concrete base. We can offer a base construction service and our full-time base team travel the country each week laying bases for our customers. Our team will visit at least a week before your building is due to be installed (to ensure the concrete has set) and you can be confident that your building will sit on an even level and won’t deteriorate prematurely. The concrete bases we lay are normally around 100mm in thickness and sited on earth, we try to ensure the base sits 50mm above the ground, to give extra elevation, away from soil that could rot the timber. Our concrete bases are reinforced to guarantee longevity. 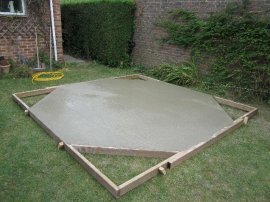 If you already have a concrete base in place, or if you are getting a local builder to lay the base for you, we recommend that the base is made using the metric size of the building going on top of it to allow rainwater to run straight off the building's roof and into the surrounding garden. This will minimise pooling water around the lower boards of the building, which is something that would eventually lead to damp problems. Please ensure that the base is within 5mm of level before we install your building, even if a professional has done the job for you. View our complete range of Garden Sheds, Summerhouses, Garden Studios, Garden Rooms and Timber Garages here. If you would like to know anything else regarding our bases, products or services then request a callback or call us on 01760 444229 to speak with one of the friendly team. Alternatively, you're in the area why not visit one of our Seven UK Show Centres, to experience the luxury service we provide first hand. We have over 25 different size and style garden buildings for you to view at your leisure.